Silver-grey fur coat, with a brownish tinge on feet, face and along the back, especially in summer; tail fringed white. Much larger than the red squirrel, which has uniform reddish-brown fur. 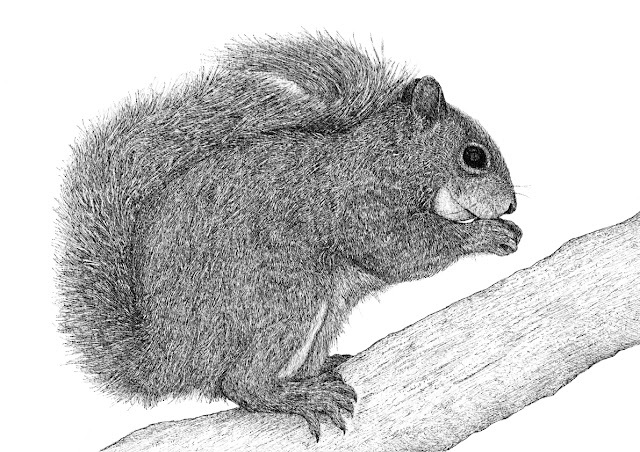 Eastern gray squirrels eat a range of seeds of trees such as oak, beech, hazel, sweet chestnut and walnut. When these supplies run out in early summer grey squirrels turn to a variety of flowers, buds, shoots, pine cones, fungi, peanuts from bird feeders, birds' eggs and young.